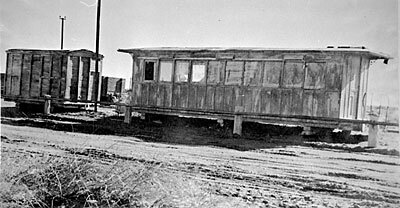 Many small four-wheeled wagons were used during the construction work. These had planked sides and semi-circular topped ends. They were lettered C. R. C. A. R. I am not sure of the meaning of this, but it was also found cast into a weighbridge at Trelew (supplied by the agents 'Bolling and Lowe' who dealt with railways in Brazil as well as Argentina). I suspect it to be an English language version of the FCCC name, probably including the words Central, Chubut, and possibly Argentine in the title. On the other hand, perhaps it was in Welsh! The wagon axleboxes were also lettered FCCC. 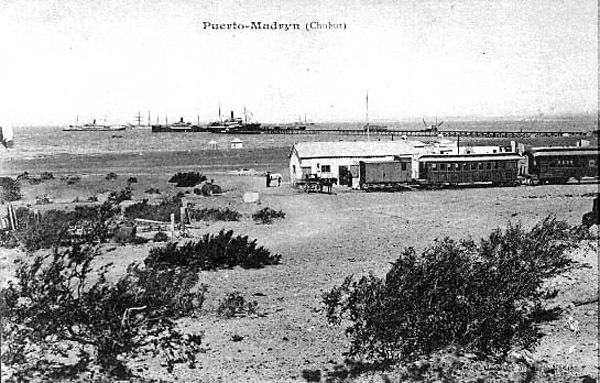 Some of these trucks can be seen in an enlargement of one of the 1908 postcards of Puerto Madryn further down the page), but on the opening day there were also bogie flats and vans (boxcars) in use, as well as a four-wheeled brake van (caboose) with a birdcage roof at one end. The earliest figures for rolling stock suggest that in 1896 there were 6 coaches (totalling 199 seats), 2 furgons, 10 plataforma wagons, 14 boxcars ('cubiertos'), and 29 high-sided 'cajones'. 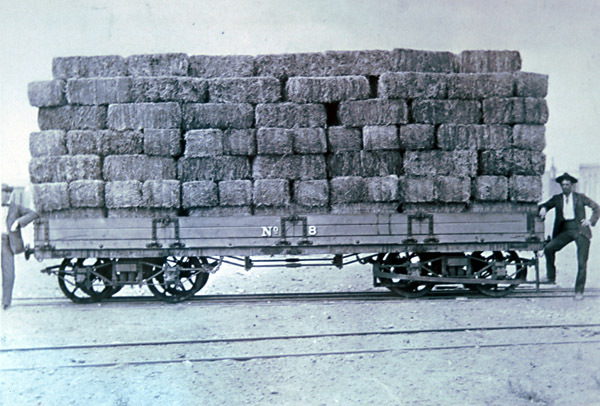 The low-sided bogie wagon illustrated below with a load of hay or straw is one of the ten-tonners listed above. These were built by Ashbury's in 1888. On the other hand, the flatcars loaded with wool bales below, appear to be a good deal larger. These may well have been twenty-tonners from the list above. 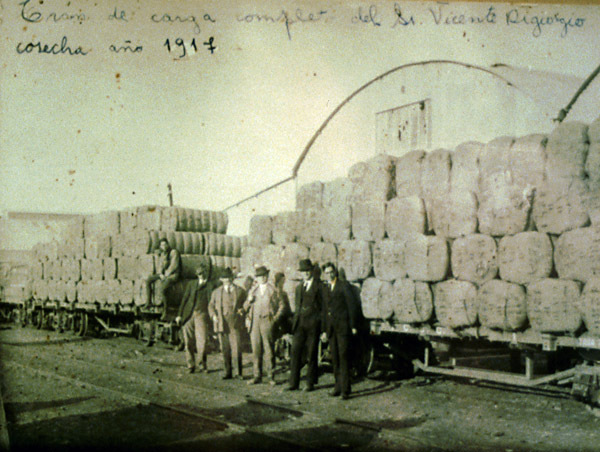 This photo illustrates a train of wool bales from a Señor Digiorgio's estancia on their way to be shipped north in 1917. The most comprehensive stocklist comes from the 1940 working timetable. This lists a number of metre gauge vehicles despite them being in store by then, including twenty-five platform wagons built by Metropolitan Amalgamated Railway Carriage & Wagon Co. in 1904. Sylvester Damus suggests that these may have been purchased second-hand from the state railways. The book 'Metro-Cammell - 150 Years of Craftsmanship' (2) confirms that the FCCC was one of the customers of the Metropolitan ARCW, which was a constituent of Met-Cam existing from 1903 to 1918, however, this may be on account of the passenger vehicles listed further down the page. A photo from the 1920s. Whilst the train approaching from the right is on the new 75cm. gauge, the boxcars to the left are on the metre gauge. These appear to be relatively modern vans with pressed steel sides. They are probably of the 1908 G. R. Turner series, nos. 30-9. 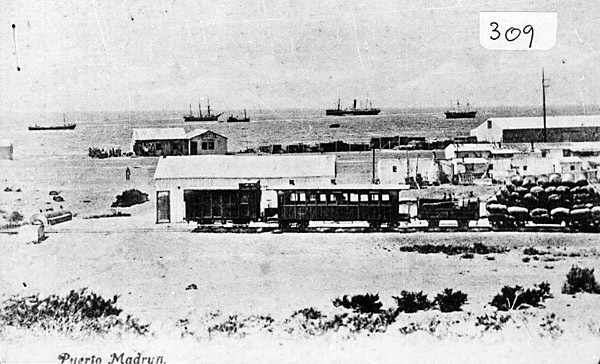 A postcard of the new 1909 Puerto Madryn station is interesting as it shows several different vehicles (3). The nearer plataforma is 108, built 1908 by G. R. Turner and Co. The next plataforma is 112, built 1911 by Stableford and Co. The nearer coach is second class no. 4, built 1886 by Brown Marshalls. (identifiable as it was the only non-clerestory coach with only two compartments and therefore two lamp tops.) The further coach is more difficult. I have still not managed to identify the FCCC's clerestory coaches fully. They bought a couple second hand from the Central Norte which complicates the issue. C & W Co. Height 2.84m., Width 2.040m., Length 7.670m. Bolling & Lowe (A) probably from Ashbury Height 2.848m., Width 1.829m., Length 4.316m. G. R. Turner & Co.
All intact in 1895 and 1940. C & W Co. Height 1.230m., Width 1.981m., Length 7.670m. C & W Co. Height 2.071m., Width 1.829m., Length 4.316m. Orig-inally at least 25 of these. By 1940 only nos 50-52 survived in service. (A) Height 1.981m., Width 1.829m., Length 4.316m. (A) Bolling & Lowe were agents as well as manufacturers. They may have fastened their own plates, causing confusion to later observers. (B) Vehicles in the 5000 and 7500 series were bought second-hand from other railways, most probably the FC Central Norte. (C) No. 30 was fitted out as a postal van, as noted in the original 1934/40 documents. (D) As the photo at the top of the page shows, there were more of these low-sided four wheeled wagons. This stocklist shows a large number of vehicles which were not present at the 1922 inventory (2), including the 5000 and 7500 series vehicles. Were these imported from elsewhere after 1922, and before the regauging of the line? 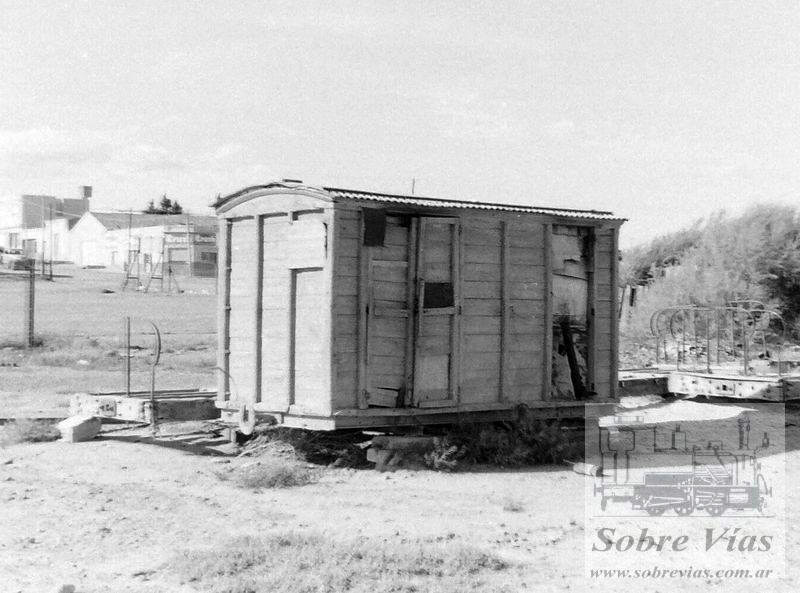 Some of the clearest pictures of rolling stock from the early years were taken from the hillock behind Puerto Madryn station. This seems to have been a favourite vantage point and three shots from that point are displayed here. 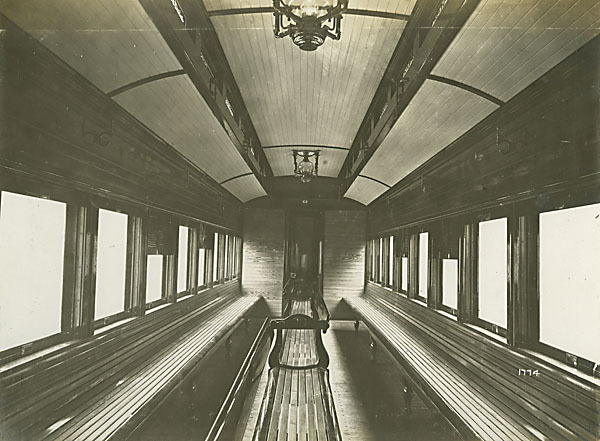 The first photo shows one of the short coaches with end balconies and shallow curved roofs. There were certainly three of these for 1st class passengers (Nos. 2, 3 and possibly 4) and two like this one shown here for 2nd class passengers (perhaps nos. 5 and 6, though no. 4 later was downgraded to a 2nd class coach), divided into two compartments each with an oil lamp in the roof. They were supplied by Messrs. Bolling & Lowe of London, but this company was an export agent as well as a manufacturer of railway equipment, and the coaches may have been built by one of the more established rolling stock manufacturers in the UK. The second picture shows a similar coach, though with three lamps and with a different window and ventilator pattern. This is one of the three first-class cars with three compartments. There is also one of a pair of four-wheeled 'furgones' or brake-vans, with a 'bird-cage' roof. A close-up view of several of the Bolling & Lowe coaches. The one on the right is a first class coach, distinguished by its three ventilators above the windows. 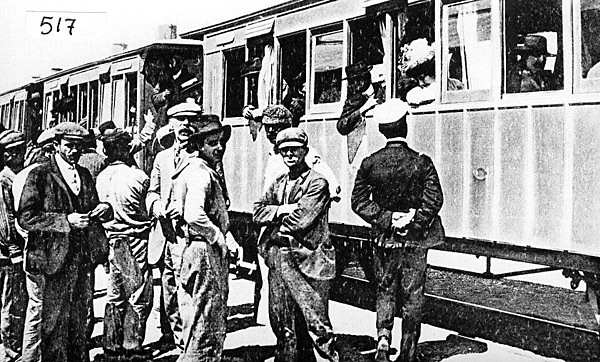 The next coach to the left is a second class coach, with two such ventilators. Of additional interest is the letter 'C' on the coach side, giving some idea of how the railway's namewas initially displayed. These Bolling & Lowe coaches survived to be converted to 75cm gauge after the state takeover in the 1920s. They seem to have operated largely on the Rawson branch thereafter. One was in static use at Playa Unión in the 1950s along with a four-wheeled van, as seen below. At the opening there was also a clerestory-roofed 1st class saloon (probably car no. 1 as this was a good deal heavier than the other carriages). This is possibly the centre vehicle in the photo below. This picture was a postcard, kindly provided by Christopher Walker from his collection. The photo shows another clerestory coach (almost certainly a later arrival and possibly no. 20 of 1908 as the window pattern looks similar) and a birdcage brakevan as mentioned above. The latter is probably 'furgón' (brake van) No. 1 or 2 from Ashbury's, listed in the tables below. 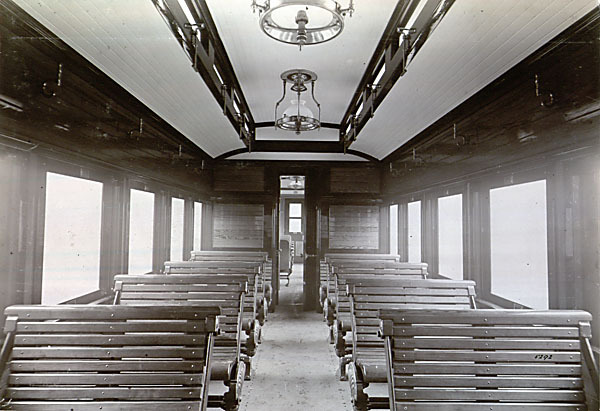 The next photo is supposed to have been taken on the opening day, and shows this first clerestory-roofed coach. Certainly the number of windows is identical to the vehicle in the centre of the previous photo. Note that it has flat ends to the cantrails unlike the later vehicles illustrated below. After the take-over of the company in 1906, the carriage fleet also benefited from the new energy and investment. In 1908 a composite carriage, no. 20, arrived from the Ashbury works of the Metropolitan Amalgamated Railway Carriage and Wagon Co. Ltd. The photos below show the vehicle's exterior and interior shots of the first and second class saloon, as recorded before despatch (5). The builders' photo of coach no. 20. Details recorded on the mount include: length over platforms 55' 0", length over corner pillars 49' 6", width over corner pillars 8' 1 1/4", height inside at centre 8' 4 7/8"and at side 6' 6 3/4", centres of bogies 37' 0", wheelbase (of bogies) 6' 6", gauge 3' 3 3/8", diameter of wheels 2' 6", seating 15 first class 53 second class, tare 21 tons 2 cwt 0 qr. 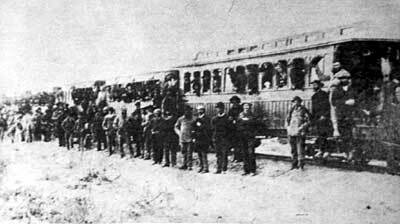 The legend on the board beneath the carriage reads: "CENTRAL OF CHUBUT RY. 1st & 2nd. 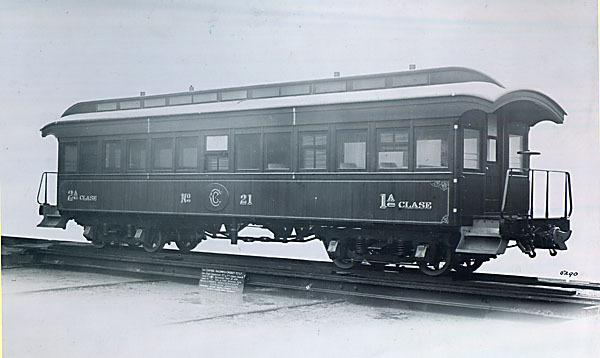 Class Carriage Built by M. A. R. C. & W. Co. Ld. Ashbury Works. Manchester." It will be noted that there is no continuous brake fitted. The interior of the first class saloon, looking towards the end balcony. The seats would appear to be of the reversible tramway type. 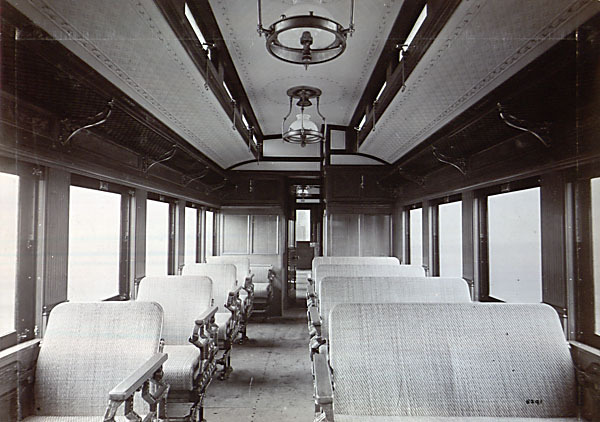 The interior of the second class saloon, looking towards the middle of the carriage which contains a toilet and washbasin. Wooden bench seats run along either side, and also down the middle with the centre ones having backs alternately on either side. In 1915 the Ashbury works supplied another composite carriage, no. 21, strangely somewhat shorter than no. 20. Again the external and internal appearance was captured before shipment to the Argentine (5). The shorter length of this carriage is clearly shown here. The detailed dimensions noted on the photo mount include: length over platform headstocks 43' 6", length over corner pillars 38' 0", width over side sheeting 8' 2 1/4", height inside at centre 8' 4 3/4 and at side under cantrail 6' 6 1/8", centres of bogies 25' 6", gauge 3' 3 3/8", buffer height 2' 6 1/2", diameter of wheels 2' 6", seating 15 first class 30 second class, tare 15 tons 4 cwt 1 qtr 22lbs less wheels and axles (!). A comparison of the two vehicles and their dimensions suggests that Ashbury's standard window bay measured approximately 2' 11" in length. The board in front of the vehicle carries the legend: "THE CENTRAL RAILWAY OF CHUBUT CO. LTD. One bogie composite 1st & 2nd Class Coach, SPEC N4?5. REFERENCE SPEC M.100. Indent No. – Date of Order 10th October 1914. Messrs LIVESEY SON& HENDERSON, CONSULTING ENGINEERS. Metropolitan Carriage Wagon & Finance Co. Ltd., Builders, Ashbury Works, Manchester." The first class saloon seen looking towards the centre of the vehicle. 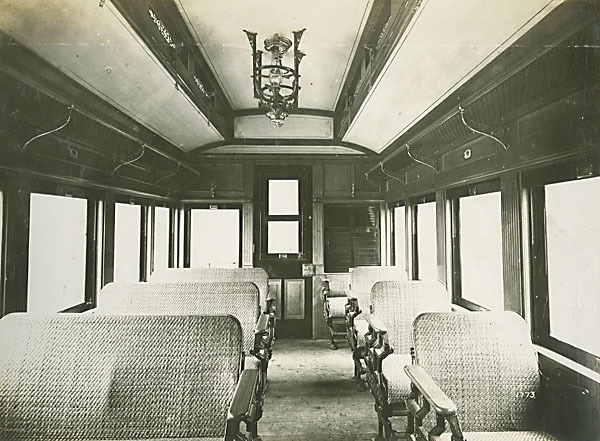 The seating is similar to that in the 1908 coach. The second class saloon on the other hand has transverse seating of reversible tramway pattern. In both saloons the oil lamps appear to be of a simpler design than those in the earlier vehicle. 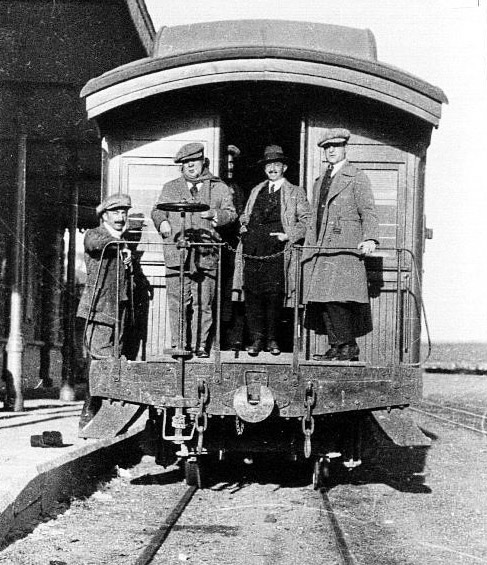 At the opening of the Gaiman - Dolavon section in 1915, one 1st class vehicle is supposed to have jammed in Gaiman Tunnel. The score marks in the brickwork were pointed out to me in 1975! Mr. S. Jones stated that two 1st class saloons were purchased from the FC Central (Norte?) as a result of this, and that the original vehicle was restricted to use below Gaiman. The carriage below has a relatively flat roof end, similar to the smaller one of the two above. If that is so, then it would not have been that vehicle which stuck in Gaiman tunnel. It is more likely that the larger of the two shown above was the original (No. 1), and the smaller (shown also below), will have been one of the two FC Central Norte vehicles (Nos 191 and 394) purchased later. The 1922 inventory (2) lists 2 first class coaches, 2 second class coaches and 2 mixed (composite) coaches. Back in 1895 there had been a similar number in total but one of the second class coaches appears to have started life as a 'salón'. 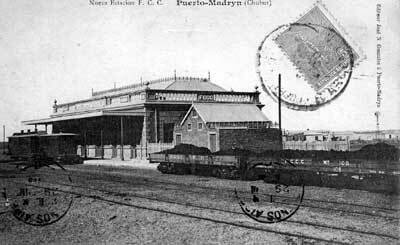 This undated photo at Puerto Madryn station shows an end-on view of one of the two last coaches of the railway. It has not yet been possible to identify precisely which coach this is. It is interesting to see that the chopper coupling has a security bar and that there is still no continuous brake. Passenger stock list 1940, including 'furgón' brake vans. This clearly shows more vehicles than were in the 1922 inventory. It is possible that others were brought in later by the FC Estado but more likely that the 1940 list includes vehicles that were out of use in 1922 and not counted. Though not shown in the 1940 stocklist, there were clearly at least five of the original short 'Bolling & Lowe' coaches, three 1st class and two 2nd class. It is possibly that these were numbered 2 to 6, and that no. 4 was later downgraded to 2nd class whilst nos, 5 & 6 disappeared. Given that no. 4 is shown here as built by Brown Marshall, it is possible that the others were also constructed by them. Bolling & Lowe were agents not builders. These were the 2 original furgons with birdcage roof. Height 3.068m. ; Width 1.85m., Length 5.232m. (four wheeler), with postal compart-ment by 1940.
with postal compart-ment by 1940. (B) Bolling and Lowe were agents working in Brazil and Argentina, rather than car builders, They may have affixed their own plates, leading to later confusion. (C) Ex FC Central Norte? It is strange that this 1940 stocklist shows 4 first class coaches compared with the 2 shown in the 1922 inventory. It seems logical that vehicles numbered 1-4 were the first passenger cars on the line. Nos 2, 3 & 4 (the 5.5 tonners in the table above) were probably those with low almost flat roofs, as seen in the top photos above. 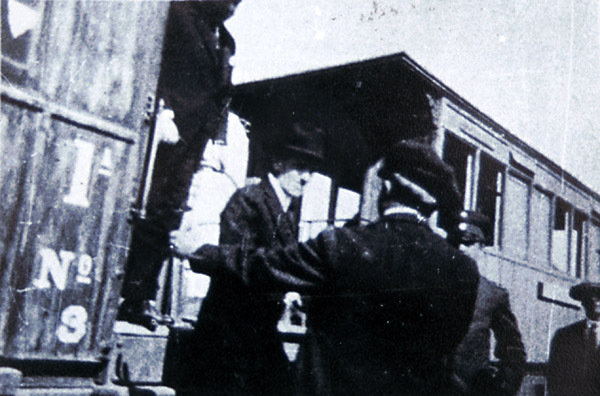 The following picture, from Rawson Museum, shows the provincial governor arriving at Rawson by train. This dates the picture after the 1924 opening of the branch. The two coaches visible are both original metre gauge cars from 1886, converted to to 75cm gauge as suggested in the table above. The left hand one is clearly car no. 3 and is a first class carriage. The other has the two air vents identifying it as 2nd class car no. 4. This is not the only photo showing ex metre gauge cars on the Rawson branch, but whether they were specifically allocated to Rawson trains is not known. Chopper type couplings were used on all vehicles, initially with side chains. After 1924 there must have been less and less use made of the metre gauge stock until by 1931 the metre gauge ceased altogether. As the tables show a few vehicles were converted to the new gauge and others were put into store. Some vehicles, however, must have been scrapped. It is possible that the FCE may have transferred some of the more modern vehicles to metre gauge lines in the north. The fate of one of the original small vans is made clear by this photo taken after the abandonment of the 75 cm sytem and published on the Facebook Sobre Vías page. It was taken in Trelew before the site was completely cleared. 1 Inventory on the occasion of the government taking a lease, reported in the Review of the River Plate, August 18 1922, page 421. 2 Metro-Cammell - 150 Years of Craftsmanship, Steve Mourton, Runpast Publishing, UK, date not known. 3 From the collection of Christopher Walker. 4 Kindly provided by Sylvester Damus. 5 Builders' photos from the Metropolitan Cammell collection held by Birmingham Central Library, to whom we are indebted for the copies.